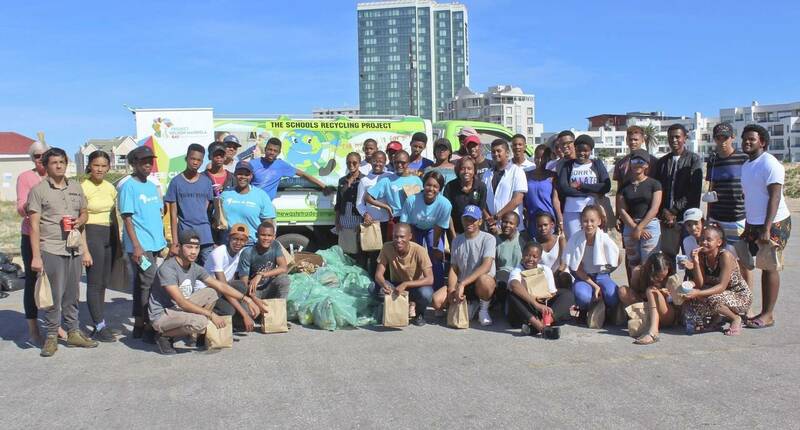 29 March 2019 - Unity in Africa, in partnership with Project NMB Clean City and Something Good, hosted a beach cleanup at Pollock Beach. Emmy Nxayeka, Schools Project Manager at The Waste Trade Company, started the event with an educational talk about recycling. "We implement a two bag system, one for recycling and one for general waste that will go to landfill. Learners are encouraged to take this knowledge back to school where they can take ownership for their school’s waste and start their own recycling projects. Laurene from Unity in Africa Project Coordinator Laurene Booth Jones was pleased that their learners had to apply what Emmy had taught them. “I could really see them thinking about each item they disposed of, it’s a great way to practically educate them,” she shared. 40 learners from 14 different schools were seen participating. The Cleanup started at NMU North Campus, where a few university students joined. They cleaned up the sidewalks whilst they strolled down to Pollock Beach where the cleanup took place. Various items of litter were collected, many of which could be recycled. The strangest items found were a back pack draw string, an expensive looking bottle of champagne and a plastic plate.